Once upon a time I was at Starbucks and I ordered a lemon cranberry scone (for the first time ever) to go with my latte. I died of the deliciousness. The end. Okay, clearly I didn’t die, but my taste buds were dancing and my stomach was happy. I needed another and dontcha know every time I went to Starbucks after they were out. Surely I could make them at home? So I did! Turn oven on to 400 and mix 1 ¾ cups flour, 1/3 cup sugar, 3 teaspoons baking powder, 1/2 teaspoon baking soda in large bowl. Then cut/fold 5 tablespoons butter (or margarine) into flour mixture until crumbly. Then add 2/3 cup buttermilk, 2 teaspoons lemon zest, 1½ tablespoons lemon juice and ¾ cup dried cranberries and mix until just incorporated. Don’t worry if it’s a bit crumbly. Gently knead onto baking mat (can be lightly floured if you need, I didn’t) and form into a round disc. This dough is a bit lumpy and it was about ½” thick or so. Then cut the dough into eight, I used a pizza cutter and it worked great. Then you bake for 15 minutes or until just golden brown. See recipe for glaze included in the recipe card below. 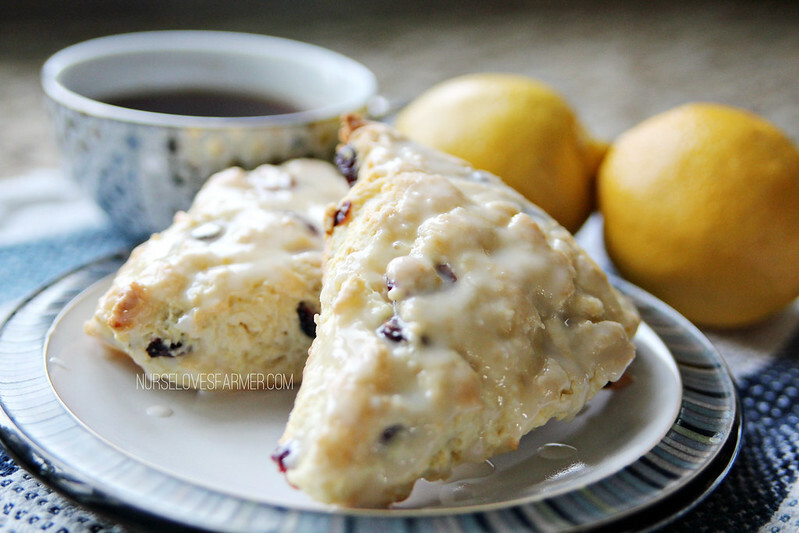 Lemon cranberry scones with a bittersweet lemon vanilla glaze will have you wanting to eat all eight of these by yourself. Preheat oven to 400ºF and line a baking sheet with parchment paper or silicone baking sheet; set aside. In a large bowl, combine the flour, sugar, baking powder, and baking soda. Fold in the butter with a fork or pastry cutter until the mixture has become crumbly. 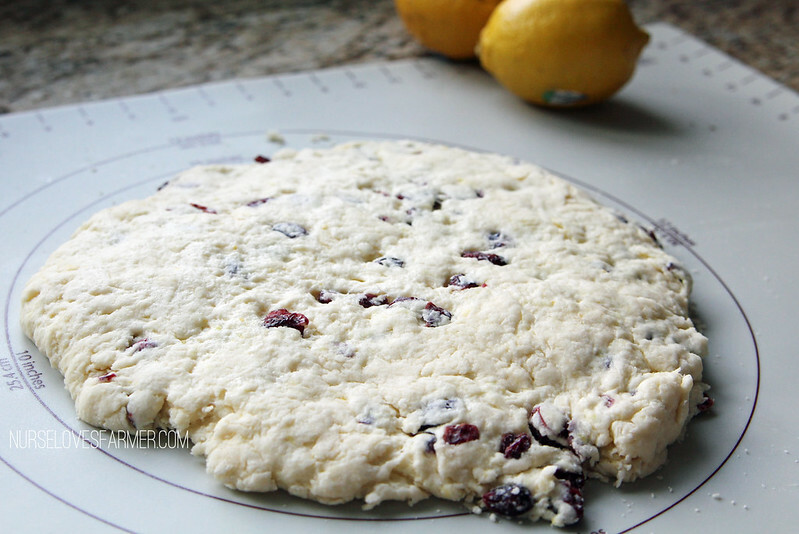 Add in the buttermilk, lemon juice, lemon zest, and dried cranberries. Mix until just incorporated (may still be a touch crumbly - that's ok!). Turn the dough out onto a lightly floured surface and form into a round disc. (I gently kneaded just until all was mixed & didn't need extra flour). Use a pizza cutter & slice into eights and bake for 15 minutes or until golden brown. While the scones are cooling, prepare the glaze by mixing everything together in a small bowl. Drizzle, drench, pour (you pick!) over the scones. Recipe adapted from My Happy Place. Please stop licking your screen. Oh, you aren’t? Just me then? Awkward… 🙂 Try these out and let me know how much you love them – because I know you will. I’m not a scone connoisseur by any means. This is only my second scone-making experience ever and it’s easy – I promise! I changed the recipe slightly! I added a teaspoon of lemon extract for some extra lemon flavour to the batter and a little bit in the icing! My recommendation is to soak the dried cranberries is boiled water for a few minutes before adding them to the batter so they are nice and plump!! I also needed 1 extra tablespoon of butter and a little extra flour! Mine also grew a lot so I would probably cut them in half one more time before baking them. I would make these again!! they were great!!! thank you!! Great to know! Thanks, Ronnie! Thinking of making mini scones for a tea party. 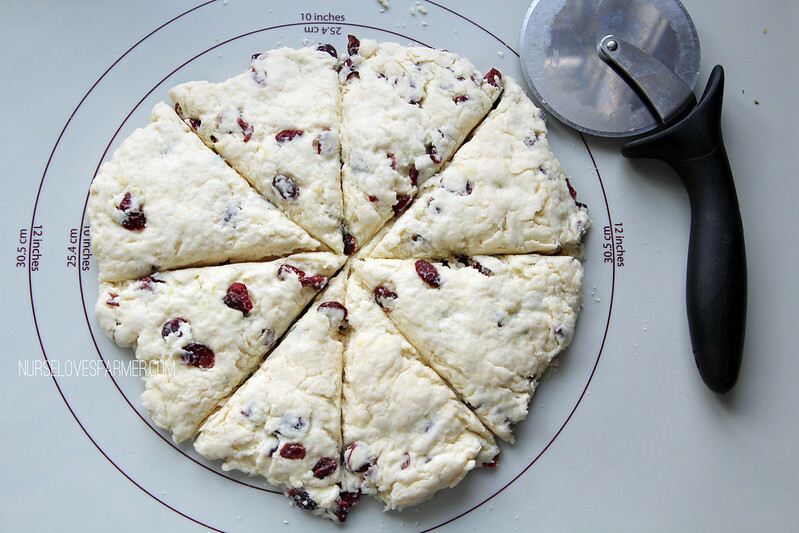 Do u have any idea if u can use this Rec n make 2 smaller circles n how long to bake? I don't, sorry. Just keep an eye and take them out as soon as they start to brown! These are delicious! Made them for a wedding shower and everyone just loved them. Thanks so much for the wonderful recipe 🙂 . Thank you for the feedback and I'm so glad they were loved! I came across this recipe because I was originally planning to make orange cranberry muffins but as soon as I was done chopping up the cranberries I realized we don’t have eggs…so I decided to find a recipe that requires no eggs since the cranberries were already chopped. And I found this! These are delicious! I used fresh frozen cranberries and chopped them in half and then made two portions with lemon and another with orange. Then I made a glaze for the lemon ones with milk, powdered sugar and lemon zest and for the orange I did powdered sugar, orange zest and squeeze of orange juice. They are delicious! The fresh cranberries are tart so not really sweet but with the glaze it’s perfect! Thanks for the recipe! Sounds amazing, glad you found it and enjoyed! I always always use salted, doesn't matter either way! I just tried this recipe and found that the dough was very wet! In order to kneed I had to add about another cup of flour. They still turned out awesome! Hello Sarah. tried these this morning and substituted buttermilk for half and half only because I didn't have buttermilk on hand. The only problem was that 400*F was way to hot and burnt the bottom of all of my scones (I doubled the recipe so there were a lot LOL) But as far as the scone itself minus the bottom burnt portion, they were delectable. So moist opposed to the other recipes. Just wanted to give you 2 thumbs up for sharing this wonderful recipe. Other than the oven temp (could be my oven), Its a keeper!! Oh thanks! I have made these many times with no burning problems…maybe it was the lack of buttermilk? Who knows! My SIL has problems with her oven burning too! Sarah, I happened to see your beautiful scones on a pin through pinterest,,, And I made them shortly after pinning to my board. The recipe is GREAT!!! I shared them with my neighbor also,,,,So tender and moist,,,,,I used frozen, wild Maine Blueberries,, as I did not have cranberries.. But I plan to make the cranberry version soon., As another poster questioned about cranberries,,, I was going to use fresh,,,and have found that when you use fresh cranberries in a recipe such as this,, it helps if you add a touch more sugar to the recipe and chop the cranberries slightly.. Thank You very much for sharing this recipe….. Thank you so much for the great feedback as well as for sharing the fresh cranberry tip! Can I use fresh cranberries. A fantastic question that I don't have the answer to! I imagine you could, admittedly I've never used fresh cranberries for anything though. These look delicious! 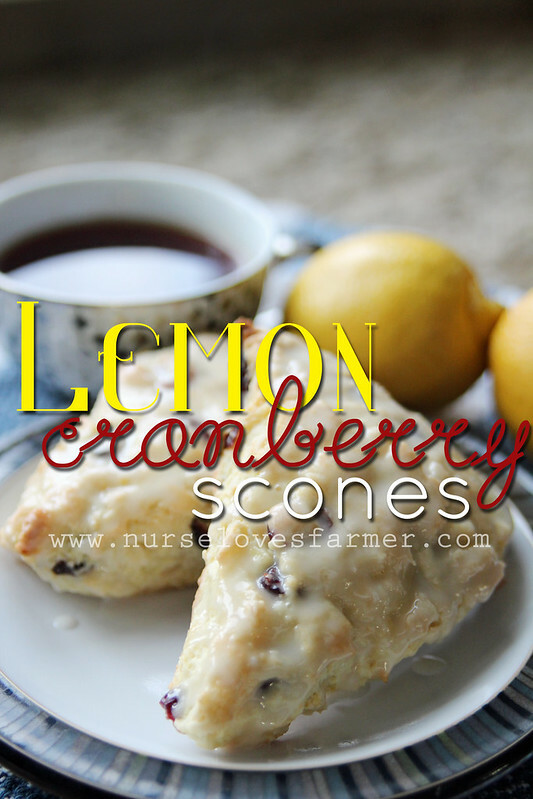 I have only made scones once and they were awesome, I think I need to try these now! Um, and a baking mat is new to me, but I love it. I am terrible and measuring or guess-timating as I say. Wow… these look amazing. I have to make these! They are and they're easy, going to make them again this weekend! Thank you for the recipe. Your scones would be hundreds of times better than anything Starbucks has shipped in from some place mass producing their product. Your scones even look way better in the pictures. Your lucky day and your families too when you decided to bake them yourself. I hope you try them, Marjorie – they really are GREAT! And yes – fresh is always best!! Oh My Goodness. Sarah, I tried these this morning – substituted Almond Milk for the buttermilk and they are awesome. Truly very easy to make. I'll definitely be making these again. Thanks for sharing the recipe, it's a keeper!